The Hanna Andersson clothing brand is all about letting kids be kids: giving them freedom to explore, play, get dirty and know that everything is comfy and good. The company believes that giving kids quality matters, with supersoft organic cotton, comfy seams, and long-lasting durability. This focus on quality and durability comes from its Swedish roots; Sweden is a place where families buy the best they can find and make things last for a long, long time. The brand began 30 years ago, when Sweden-born Gun Denhart and her husband Tom, a native of Portland, Oregon, settled in his hometown, had a baby boy, and christened Hanna Andersson in their garage. Initially the company reached customers only by catalog, but over time the Hanna brand grew to include over 50 retail locations in the US and an eCommerce website that serves millions of visitors. While the simplicity of Hanna Andersson’s commitment to quality and durability remains the same as it was from the start, retail marketing has gotten remarkably complex in the decades since. To continue acquiring new customers (and to reactivate dormant customers on its list) in the new marketing landscape, Hanna Andersson’s new Director of eCommerce, Mimi Ruiz, chose a radically simple idea: reach them through the brand’s existing customers, with referral marketing. In March 2015, this effort kicked off with a refer-a-friend program powered by Extole. Advocates share referrals with friends, who receive a 20% discount on their first purchase. Those advocates then earn 20% off toward a future purchase. 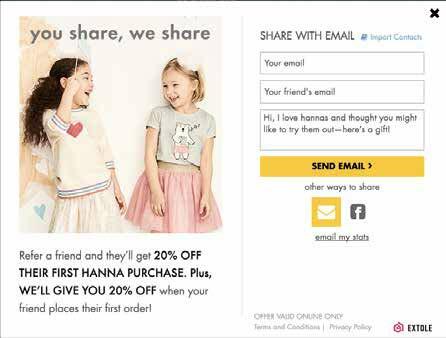 Like its clothing, Hanna Andersson built its referral campaigns on simple but solid fundamentals. They knew that to successfully acquire new customers, referrals must be easy for people to find whenever and wherever they interact with the brand. They must be easy to share and use. And they have to be rewarding for customers to participate in the program. The Hanna Andersson website features multiple calls to action: in the top navigation and the global footer, on the post-purchase confirmation page, and also on a dedicated landing page. All of them are mobile optimized so they’re visible on any size screen. On the Hanna Andersson mobile site, refer-a-friend also gets its own item in the hamburger menu. The program exists beyond the website: it’s promoted in the company’s catalog, through Facebook posts and retargeting, on Twitter, and through a dedicated email blast. In the near future, Ruiz plans to expand promotion to include prominent banners in marketing emails, inclusion in transactional emails, and product-level site placements. The Extole platform’s built-in responsivity ensures that consumers get the same, simple sharing experience whether they’re on desktop or mobile. Crucially, the program requires no login or registration, so there are no hurdles for customers to jump over on their way to sharing. When friends click on a referral and land on the brand site, they’re automatically confirmed as having come through a referral and shown their 20% coupon code. Once an advocate earns a reward for sharing, they immediately receive that reward by email. There’s no waiting around for Hanna Andersson to reconcile its records at the end of the month. Even though fulfillment happens with speed, the company isn’t sacrificing customer quality. To ensure the program acquires only new customers, Hanna Andersson and Extole use a number of verification and customer-quality checks that happen silently behind the scenes during checkout. By following through on the fundamentals, Hanna Andersson has scaled a referral marketing program that converts new customers at three to four times the conversion rate for other channels. It’s a high-quality source of high-quality customers for a retailer that cares about quality above all else, and it’s poised to grow almost as fast as all those comfy kids in their Hannas.